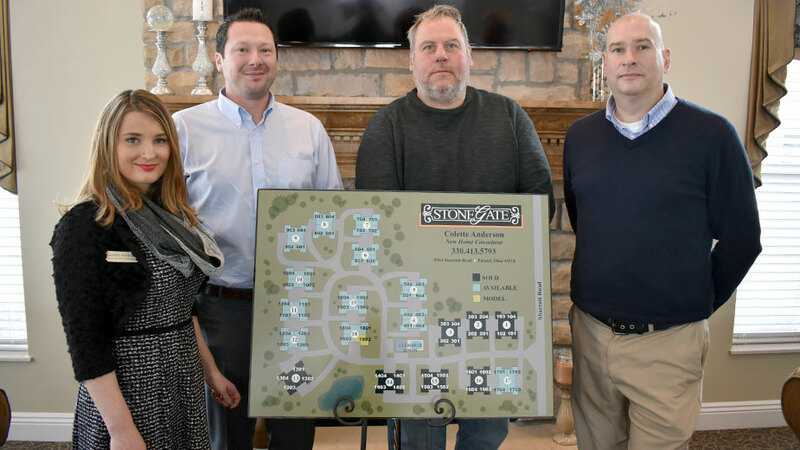 POLAND, Ohio – The owner of Stone Gate Condominiums development plans to have the new model for condos at the development completed by summer. L&M Holding LLC, Westrville, acquired Stone Gate about a year ago, said Tim Henn, L&M’s director of operations. The target market for the development, which offers ranch-style condo units, is “active retirees,” he said. So far, the development has 24 units, four of which include up to 1,800 square feet of space on average, said Colette Anderson, new home consultant at Stone Gate. The new Rosewood floor plan design will offer four, two-bedroom units in each quad of approximately 1,900 square feet. All are one-story, open-concept units with a two-car garage attached, she said. “It’s more of a modern floor plan,” Anderson said. The new Rosewood floor plan features four, one-story, open-concept units with two bedrooms and a two-car garage, said Colette Anderson, Tim Henn, Steve Greenhill and Jason Burdette. Once completed, Stone Gate will have 76 units. “It is a regular house. It is an attached product, but it doesn’t give that feel when you’re in it,” Henn said. The units will sell for $245,000 each, plus homeowner association fee, which covers exterior maintenance such as landscaping, mowing and plowing. Construction is underway now on the model for the site. “It’s hard to tell because of the snow but we have actually poured the footers,” Anderson said. Since construction began recently, Stone Gate is just now focusing on marketing and advertising, Anderson said. In addition to the amenities of the units themselves, Stone Gate also offers a clubhouse with fitness room, outdoor pool and a pond. The development is “minutes away” from shopping, dining and entertainment options in Boardman, she said. Pictured above: Steve Greenhill, Tim Henn, Colette Anderson and Jason Burdette say the footers are poured, and with the snow, the model should be erected within the next six months.